You don’t just end up with a leather couch. Leather furniture is an investment, a statement piece in your home that you want to make sure looks great. Leather furniture I more high-maintenance than other upholstery types, but the beauty is worth the effort. Plus, if you follow these simple steps, it’s not hard to keep your leather furniture in great shape. You already know that leather furniture should only be used indoors. However, did you know this it should be kept out of the sun altogether? That’s right, the sun can cause your leather to fade or crack. That includes sunlight through a window. Try to position your leather furniture so that it’s out of the path of windows. If you must place your leather furniture near a window, be sure to keep the blinds closed when the room isn’t in use to reduce the amount of sunlight. Leather furniture scratches in a way that other upholstery usually doesn’t. One of the biggest culprits of scratches in leather furniture is pets. Even if they aren’t scratching at the arm like it’s a scratching post, their claws can catch on the leather when they’re jumping onto the furniture or just walking around. The best way to prevent nicks and marks from pets is to keep them off the leather entirely. Provide a different cozy place for them to lay in the room instead. One of the biggest benefits of leather is that spills are easier to clean because they don’t soak into the upholstery right away. However, that doesn’t mean they don’t need to be cleaned at all. Over time, stains will set into the leather and become permanent. If you spill something on your leather upholstery, be sure to take care of it right away. Wipe the area with a damp rag. Don’t use chemical cleaners on your leather as they can ruin the surface. If you’re using it regularly, your furniture is bound to experience some dust, dander, hair, and other build up. Luckily running the couch over with a vacuum (use a gentle attachment!) will remove the dust the comes with everyday life. Also be sure to vacuum up solid spills and crumbs. Left on the leather, crumbs can cause scratches if you’re not careful. Not all upholstery cleaners are trained to properly clean leather furniture. If your leather is in need of a good cleaning, be sure to call a leather cleaning expert. They will have the tools to clean and condition your leather without drying it out, discoloring it, or otherwise damaging it. 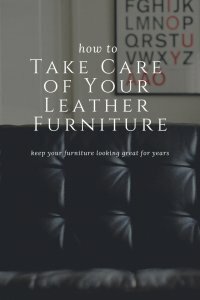 If you are careful and put a little bit of time into caring your leather furniture, it will look beautiful for years to come!